Happy Ada Lovelace Day 2016! The Papers of Ruth Fulton Benedict are available through Anthropological Fieldwork Online. Over the past year, the Vassar College Libraries have worked with Alexander Street Press to digitize and make freely available more than 8,000 pages of diaries, field notes, articles, teaching materials, and correspondence (much of which is transcribed), as well as photographs. In 1909, after graduating Phi Beta Kappa from Vassar College, in Poughkeepsie, New York, [Ruth Fulton] Benedict traveled to Europe with college friends. Following that, she was a social worker for a year, then spent three years teaching before marrying Stanley Benedict, a biochemistry professor at Cornell Medical School, in 1914. 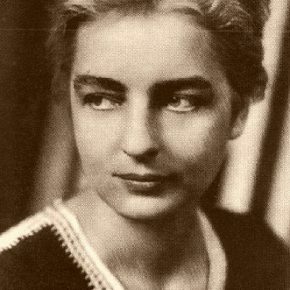 In 1919 Ruth Benedict began taking courses, first at Columbia University with John Dewey and then at the New School for Social Research with Elsie Clews Parsons whose course in ethnology of the sexes kindled Benedict’s interest in anthropology. Under the guidance of Franz Boas, Benedict received her doctorate in 1923 from Columbia, where she remained throughout her career. In 1948 she was promoted to full professor in the Faculty of Political Science, the first woman to achieve such status. Benedict’s fieldwork was done in California among the Serrano and with the Zuñi, Cochiti, and Pima in the Southwest. Student training trips took her to the Mescalero Apache in Arizona and Blackfoot in the Northwest. From her work in the field, several of her books were developed: Tales of the Cochiti Indians (New York: 1931); Zuñi Mythology (New York: 1935); and Patterns of Culture (Boston: 1934), which became a bestseller and influenced American life in that it explained the idea of “culture” to the layperson. We are thrilled that these materials are able to reach the widest available audiences through open access. Wishing you a happy Ada Lovelace Day and best wishes for a wonderful semester for the arts, sciences, and social sciences alike! This entry was posted in archives and special collections, digital library, e-resources by Joanna. Bookmark the permalink.